TSDB is a stable, reliable, and cost-effective online high-performance time series database service. Time Series Database (TSDB) supports high-speed data reading and writing. It offers high compression ratios for cost-efficient data storage. This service also supports visualization of precision reduction, interpolation, multi-metric aggregate computing, and query results. The TSDB service reduces storage costs and improves the efficiency of data writing, query, and analysis. This enables you to handle large amounts of data points and collect data more frequently. This service has been widely applied to systems in different industries, such as IoT monitoring systems, enterprise energy management systems (EMSs), production security monitoring systems, and power supply monitoring systems. Applies an efficient compression algorithm to reduce the size of each data point to 2 bytes, saving more than 90% in storage costs. Supports precision reduction, interpolation, and multiple aggregate functions. TSDB is easy to use. It supports generic time series protocols and allows you to monitor operations and maintenance. Supports high-speed data reading and writing. TSDB can write tens of millions of data points within seconds. Reads millions of data points within seconds. Writes tens of millions of data points within seconds. Supports the data validity feature. TSDB allows you to customize metrics to delete expired data. Allows you to create sliding windows to automatically delete expired data and free up storage space. Supports timeline query by metric, group, time zone, and specified precision. Supports high compression ratios to reduce storage costs. Reduces the size of each data point to 2 bytes. Supports multiple types of time series data computing. Supports linear interpolation to create data points if any data points are missing. Supports pre-precision reduction and real-time precision reduction computing for efficient query. Aggregates space by tag and computes by group. Supports multiple aggregate functions, including AVG, SUM, MAX, and MIN. Displays query results in charts and tables. Visualizes timeline query results in the console. Monitors instance usage information, including resources and capabilities of instances. Monitors data point writing and reports data writing progress in real time. Allows you to obtain storage space usage information at anytime so that you can scale up or free up the storage space before the storage space is exhausted. Provides instance and data security plans. Instances are isolated from the Internet and accessible only through VPCs for security. Supports whitelists to control access to instances from the internal network, improving data security. 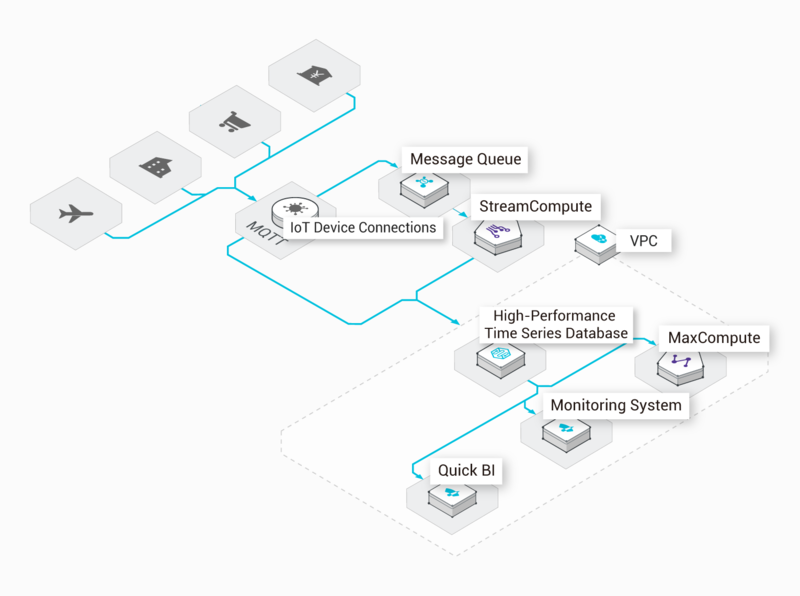 IoT devices connect to the cloud through Alibaba Cloud IoT service. Device data and analysis results are written into TSDB in real time for storage and computing. TSDB then outputs the time series data to the frontend monitoring system so that you can monitor and analyze IoT devices in real time. TSDB applies the OpenTSDB protocol to work with Alibaba Cloud IoT, message systems, and real-time computing systems, helping reduce costs associated with IoT device connection development. TSDB's high-performance time series data reading and writing enables fast reading and writing of large amounts of IoT device data. TSDB integrates with big data analysis systems and BI systems to achieve big data analysis. Real-time monitoring of industrial, energy, and chemical industry devices and integration of monitoring and analysis data. 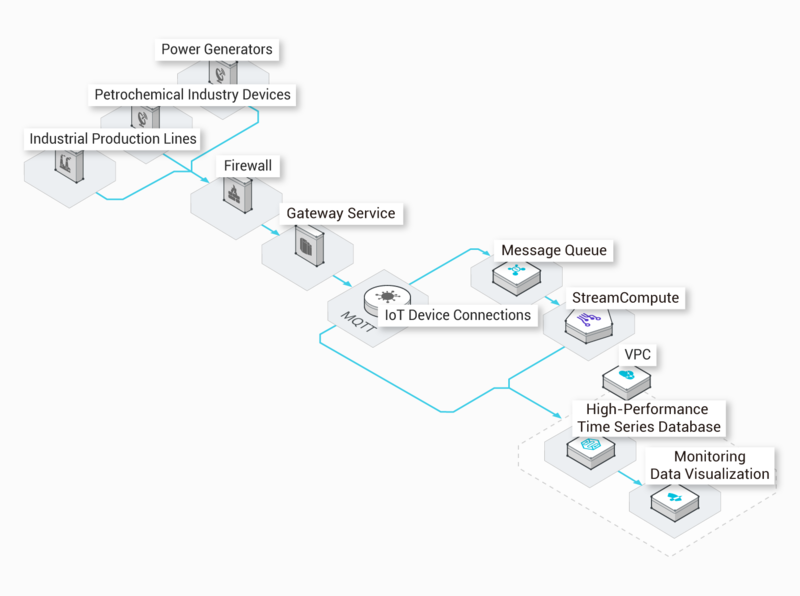 Industrial devices connect to the cloud through gateway services. Device data and analysis results are written into HiTSDB in real time for storage and computing. HiTSDB outputs time series data to the frontend monitoring system. In this way, you can monitor and analyze these devices in real time. TSDB supports high-speed data writing. 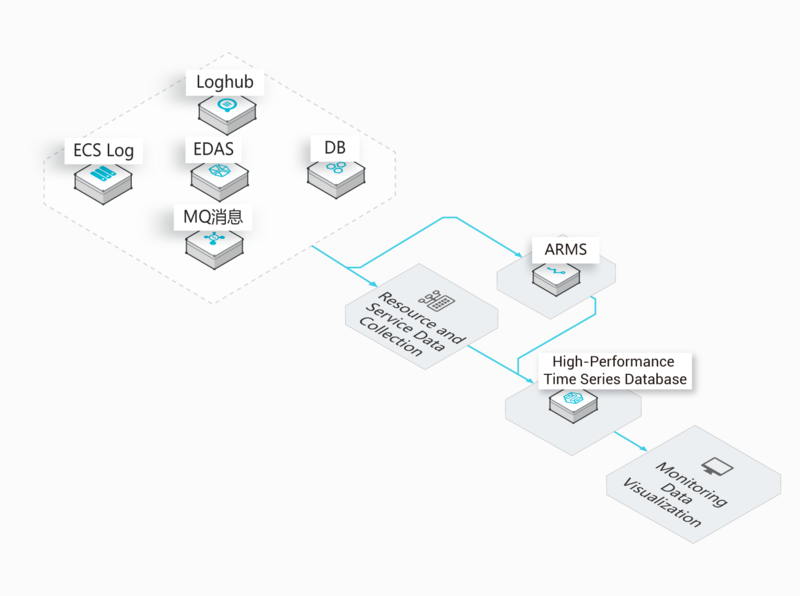 It applies a distributed architecture that helps resolve issues of performance and scalability found in time series databases of traditional industries that use a centralized architecture. Applies storage algorithms with a high compression ratio to help save storage costs by more than 90% and greatly lower an enterprises' initial investment. Provides data security and backup solutions to protect industrial device data in the cloud. Application and business performance indicators are collected through logs, messages, and other approaches, and then delivered to the computing system for real-time statistics and computing. You can then write the corresponding time series data to HiTSDB and aggregate, analyze, and display the data. Based on log collection, data analysis, storage, monitoring, and visualization, TSDB greatly reduces the costs in data storage, data analysis, and operations. Allows large amounts of devices in a cluster to concurrently write data in high speed.